From the Transactions menu, Post Annual Fees can be used to post any type of annual fee (registration, membership, insurance, etc.) to existing families or students. Family based on the Family Registration Month. A family's registration date is the date they registered with your facility, either via a Jackrabbit User (in-house) or through online registration, and is displayed on the Summary tab of their Family record. Student based on the Student Start Month. A student's start date is the date they were first added to the Family record in your Jackrabbit database and is displayed on the Summary tab of the Student record. Student per Class based on the Student Start Month. Before posting annual fees it is recommended to run a Search (either families or students based on how you post your annual fees) to find any family/student that does not have a Registration Date/Start Date on their Summary tab. Use the Search Criteria Registration Month = (No Value) / Student Start Month=(No Value). Choose what type of fees you want to post, and what details you want to apply to the transactions, in the Transaction Details to Post (What Fees do you want to post?) section. If you are posting per family you will enter the amount of the fee for a family. If you are posting per student, or per student-class, you will enter the fees for the first student, second student, and the third student. The fee for the third student is used for the fourth, fifth, etc. students in the family unless a maximum fee per family is designated. If a maximum fee exists, the fee will post for each student until that maximum is reached. If the maximum is reached it will be posted to the family in one transaction vs posting each student amount individually. If you have chosen to post fees per student or by student-class, the transaction must also match the student name (this would mean that the originally posted transaction would have to have the student listed in the student section of the transaction). Entering dates in the Duplicate Check Date From/Through fields allows you to also exclude duplicate fees for a family/student for a specified date range instead of the exact transaction date. This searches the date range in addition to matching the type, amount, and for per student fees, student name. If you would like the Family Registration Date or Student Start Date to act as a 'due date' for next year's fees select Yes to Optionally, Advance Registration Date By 1 year. Note: To keep a record of their actual registration/start date consider adding those dates to the Notes field on the Misc tab. 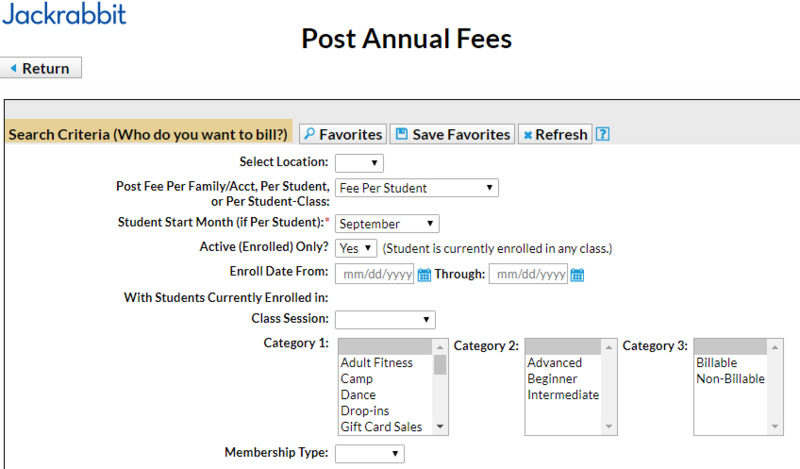 You have the option to preview the fees before you commit to posting them! The Preview Annual Fees page provides transaction counts and the option to remove a family, or families, from the batch. The fees are not posted to families until the Post Fees button is selected. If annual fees are posted in error, useTransactions > Delete Transactionsto delete. See Delete Transactions for more information on deleting a fee.